Nel Whatmore: secret garden is starting to ship! secret garden is starting to ship! 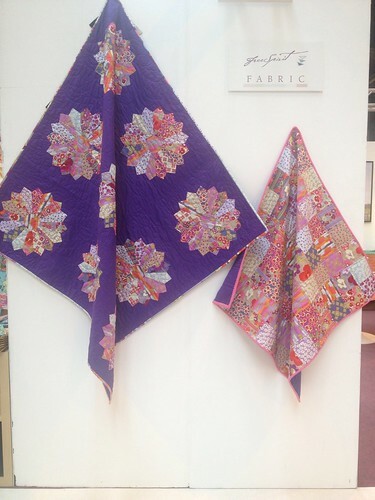 We're back from the Festival of Quilts, and it was a whirlwind! So many people, so many wonderful customers. More (much more) on that in a later post but for now, here's a picture (sorry - it's a terrible phone pic) of the 2 quilts made from Secret Garden that were hanging in the Coats stand. There will be patterns for both of these shortly. You can now buy Secret Garden from Hawthorne Threads (In the US) and shortly it'll be in stock at the eclectic maker (in the UK). We'll keep you posted on more stockists as we find them! If you are a shop or know of a shop that is stocking Secret Garden, please leave a comment and I can add you to the list of stockists. the fabrics too very tempting, missed your stand at the festival, my first visit and did not see half of it but next year plan to do 2 or maybe 3 days there heaven! Beautiful quilts Nel and of course beautiful fabrics. Looking forward to seeing it.